Is misoprostol approved for labor induction? There are many ways to induce a woman's labor or to augment it, when that becomes medically necessary. These induction methods, include Pitocin, breaking a woman's bag of waters, or stripping her membranes. 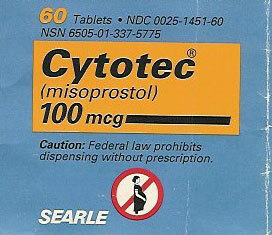 Another drug that is frequently used to induce labor is misoprostol or Cytotec. Cytotec is a drug that was developed to prevent stomach ulcers. It is also used for medical abortions during the early weeks of pregnancy, in which case it is generally labeled as misoprostol. Some obstetricians frequently use this drug to induce labor. It can be taken orally or inserted vaginally to be effective. "Cytotec is extremely effective at very low doses, is very cheap, and has been used on many, many women without their being aware that it really is still an experimental use." "I must say that I have heard some great things about Cytotec myself. I know some people who have used it and say that they have pretty good luck with it. It sounds like your ladies are pretty happy with its effects two-hour labors and such. Just be careful. I would have to say that the biggest danger is leaving the woman alone. The stuff turns the cervix to complete MUSHIE and opens it with a couple of contractions. So whatever you do, remember that you must not stay gone too long." Ricki Lake's documentary about maternity care in the United States, The Business of Being Born, even featured a woman who spent her days campaigning outside OBGYN conferences to stop the use of cytotec/misoprostol for labor induction. Her daughter and grandchild died following the use of this medication. To answer the question whether misoprostol is approved for labor induction it is not. The Food and Drug Administration have not approved Cytotec for this purpose at all, and its use in this manner is off label (obstetrician-initiated). The practice of using it anyway, without even obtaining consent or explaining the risks, is another good reason to pay close attention to anything your doctor does during labor or prenatal appointments, and to make it absolutely clear that you wish to be informed before any medical procedure is administered to you.